So you have an audition for drama school. Congratulations! You’ve made the plucky decision to apply, you’ve filled out the tedious forms (and quite possibly paid a hefty fee) and now you have a date in red pen in your diary for potentially the first step towards launching an exciting acting career. 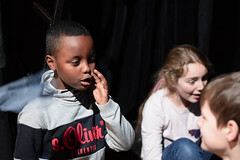 Attending a good drama school is a brilliant way to learn and put into practice the different aspects of ‘technique’, whether that’s your breathing, stagecraft or listening, as well as the time and space to experiment with your craft and meet the people that could prop your career up in the future such as agents, directors, writers and fellow actors. Although training at a drama school is not necessarily the direction for all aspiring actors, the rumours are indeed true that the race for a place is a competitive one. In 2018, the Guildhall School of Music and Drama in London saw 2800 applicants audition for 28 places on its course. However, presuming you are passionate and dedicated young actor, there are lots of ways to make the audition journey a smooth one with plenty of resources and people out there willing to support you. You shouldn’t have to feel like you are doing it all alone. Drama schools aren’t looking for the most perfect candidate who can recite their audition lines word for word (although learning you audition monologue is still very important which we will get on to). Panels are looking for individuals with potential who can be trained and so being open-minded, receptive and adaptable are important values to bring to your audition and indeed your career as an actor. If you do make a mistake, don’t let it dictate the rest of your audition. Instead, show them your ability to be resilient and pick yourself back up again. It will definitely help your nerves to be super prepared for the audition and to have a good knowledge and understanding of what could be in store. When preparing for your audition, research the ins and outs of the school, its panel and it’s audition process. There are lots of young actors sharing their auditioning experiences on YouTube and through blogs which give insights that aren’t in the school prospectus. On the day, make sure you have planned your travel route to the audition and that you arrive in the area with plenty of time to spare. Don’t let your pride take over by doing the journey alone. Talking to fellow actors, drama teachers and those who have been through the process can put you at ease. Ask them questions about the process and what they wish they had or hadn’t done. Auditioning can be a tense time so remember to share your experience and feelings with family and friends and get a trusted friend or family member to help you with practicing your monologue. In your audition, remember to talk to people there too and prepare some good questions to ask teachers and current students. Talking to the others in the audition will remind you that everyone is in the same boat and that they probably feel exactly the same. Asking people questions and chatting will also show the panel your confidence and ability to engage with others and therefore your willingness to work with others which is a super important quality. You might have your eye on a certain school but it will be beneficial to consider other schools as well, to not only keep your options open but it’s a good opportunity to get a well-rounded idea of how auditions generally run. This will be useful for industry auditions in the future as well. Sometimes the one you hadn’t even considered might actually turn out to be the best thing for you. Some auditions might require you to pick a monologue from their own list, whereas others might be more flexible. It’s important to pick something that feels true to you and that represents you well as a performer so that you can show yourself off in the best light possible. Once you have chosen the right monologue, make some time to read the whole play. This will pay off if you really want to immerse yourself in that particular character as it will give a strong sense of how that character is feeling and thinking at that particular point in the script. Getting into the swing of preparing and rehearsing for your audition is something that you will have to do for the rest of your acting career. This is the time to make the big mistakes, experiment with the ways you can deliver the monologue and also get advice and feedback from others whilst getting used to performing in front of others. It might be helpful to record your monologue so that you can listen to it when you are on the go. Auditioning with another accent- unless you are 100% confident in doing so- could deter you from focusing on your actual performance. Remember that the audition panel are looking for YOU in the performance as well as the character that you are portraying. In your audition, keep your head up and remember to breathe. Remember that you have the same right as everyone else in the room to be there and remind yourself that lots of other people will be nervous too, even if it doesn’t seem like it. Drink plenty of water and have a good meal before to keep your energy levels up. Make sure you get a good nights sleep the night before and distract yourself from your nerves by perhaps winding down with a good book, watching your favourite TV programme, listening to an inspirational podcast or chatting to your biggest supporters. Even the best actors have had lots of bad auditions! Here is a video from the folks at Backstage of some Tony Award Nominees’ sharing the not so great times.